Palin and Book Banning  Vice President oder Vice Fuhrer ? A few weeks past the 75th anniversary of the first massive book burning rally in Berlin, John McCain chose Sarah Palin to be his running mate. As one of her first acts as Wasilla mayor, Palin inquired of the town librarian what one would need to do to ban books from the library. When the librarian refused to assist her, the librarian’s job was threatened. On May 10, 1933, students from the Wilhelm Humbolt University in Berlin, egged on by Nazi leaders, pulled all ‘subversive’ books from their University library, cast them into a lot near university grounds and began burning them. 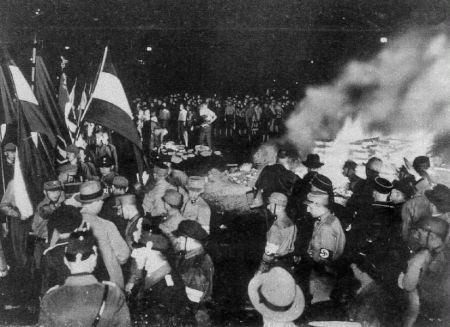 For several hours, additional books, mostly by Jewish authors, were tossed into the bonfire to the accompaniment of the singing of Nazi party songs and a speech by Nazi propaganda minister Joseph Goebbels. In what is an amazing foresight, almost a century before the book burning in Berlin, one of the most famous German language poets, Heinrich Heine, was quoted as saying "Where one burns books, one will soon burn people." Spokespeople from the McCain/Palin campaign have tried to slough off the incident between Palin and the librarian, saying the inquiry about banning the books was just “a rhetorical question”. I cannot imagine anyone asking that kind of a horrific question as a philosophical exercise. If McCain wanted to choose a female running mate, why not choose Kay Bailey Hutchinson or Elizabeth Dole? I’m not going to pretend I like either of their policies, but I know they have national experience. I know they aren’t fanatics. I know that the idea of banning books would never occur to either of them. If elected as an elderly John McCain’s Vice President, Palin could easily end up as President. The President of the United states commands not only the country’s armed forces, but a powerful, sophisticated and technologically strong cadre of intelligence organizations, the CIA, NSA etc. The thought of a person who would ban books in command of the military and intelligence apparatus of this country is terrifying. Everyone should heed Heinrich Heine and Ed Koch’s words and vote for Barack Obama on November 4th.